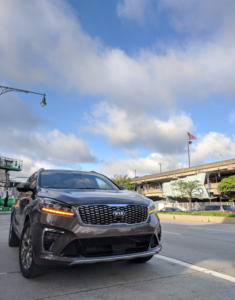 Space is definitely a big requirement for my family’s annual Morrison Golf Classic, so I was pleasantly surprised to be able to test drive the Kia Sorento during this past August for the Classic. Over the years, I’ve become a fan of Kia. As you probably know they started off as a fairly budget car company but, bit by bit, they’ve been improving their reputation and quality. 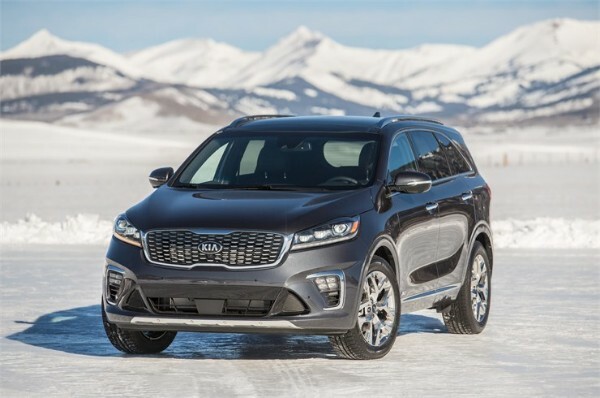 In fact, for 2018 the Sorento was awarded “highest quality” for a midsize SUV by JD Power. 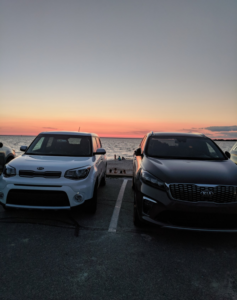 And I’m not the only one paying attention to Kia’s increasing quality– there were a bunch of Kia vehicles on site at this year’s Morrison Golf Classic– Two Sorento’s, one Kia Soul and even a Kia Stinger that traveled all the way from Florida to Cape Cod. It’s also fair to say that after years of test driving different cars, I can sometimes be a bit jaded. This is exactly why I like to have people ride in the test car with me. They will often provide me with a fresh, unbiased perspective. Case in point. After a few rides in my Pluto Brown Kia Sorento, my stepmom looked around the car again and said, “Maybe I need to be looking at a Kia.” She currently drives a BMW so that’s quite a compliment to the Korean car brand. What I enjoy about Kia is the bounty of options available on even the lower end models. The Sorento, for example, is a solid mid-range SUV. Technically, it doesn’t fall into the luxury category, but it still has plenty to offer like three different climates (driver, passenger, and rear). Plus, the air conditioning fan speed decreases in intensity (and therefore noise) when you make a Bluetooth call. The “eye of God” cameras which show the full circumference of the car were perfect parking or pulling up with enough space to open doors and unpack the car. If you’ve got a vehicle stuffed with boxes, precision parking matters. Since I had to make a few runs to Boston for airport pickups I was able to find out that the Kia Sorento’s adaptive cruise control is great in stop and go traffic but if the car is stopped for too long, the system needs to be restarted by tapping the gas pedal. Also, the car resumes speed very quickly and if the radar detects a car in front of it, it will brake itself, but it sometimes brakes a bit too late for comfort. Use it as a backup plan. While trying to get back to the Cape from Boston, the navigation system took me on a bit of a wild goose chase, which made me wonder if it was calculating for traffic, like the popular navigation app, Waze. I looked it up and, yep, this car calculates for traffic. On the negative side, the rear hatch opened twice while the vehicle was in motion. Yes, there was a was a dashboard warning chime but it was much less urgent a noise than you’d expect for a such a big issue. In my case, I had to pull over to pick up two boxes that had fallen out of the car onto the road. Thankfully the jeep behind me stopped to pick up the boxes and drive towards me while I walked towards them. Who says New Englanders aren’t friendly? I’m still not sure what caused the door to open but I’d suggest more volume on the “door ajar” notification. Overall, I liked the Sorento and have an easy time picturing it in my driveway– or potentially my stepmother’s. A Kia is a long-lasting dependable car with enough bells and whistles to make your friends with luxury cars second-guess their decision.